Learning a song or learning a system of scales? Is there really a need for OSIRE, i.e. what makes it preferable to the ordinary methodologies? In the below paragraphs I will convince you that OSIRE is a unique methodology that mainly focuses on scale systems and scale patterns with a technical approach, which none of the other methodologies apply. During my instrumental studies, which included the guitar, the bass guitar and the piano, I came across many methodologies, none of which were logically structured. Each and every one of them gave me knowledge on certain things, but never in a structured and clear way. Some random scales here, some songs there. One of my former teachers once even asked me: 'What do you want to do in today's lesson?' Not a single trace of employing a solid teaching methodology. Those so-called 'methodologies', as you can see, are no competitors to OSIRE. So the question is more like why focus on scales rather than on learning the chord progressions, solos etc. of songs. Here is a little list I made on the five fundamental things that are necessary to call something a musical creation. One should first comprehend and learn these musical systems and then apply this knowledge when learning or composing musical creations, i.e. songs. The problem is when the second step comes first. 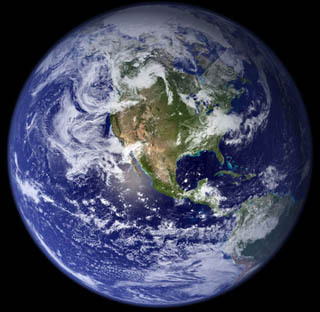 Taking a closer look at the figure, you can come to the conclusion that scale system is the first level that can be considered a base for comprehending the whole system. Although the tonal system incorporates all the key notes, which are the twelve semi-tones in the European twelve-tone equal temperament system, and these notes make up a scale (chromatic scale), music as such can only derived from the five and seven-note scales, also called pentatonics and diatonics. 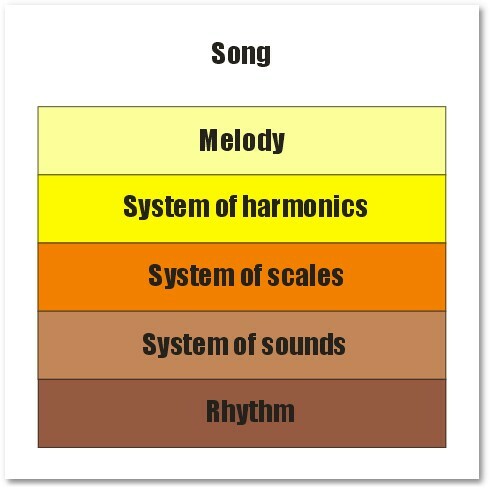 To avoid misinterpretations, I have to note here: Although I have put rhythm at the bottom of the pyramid and, in fact, it partially defines what we call music, the rest of the components above it are not derived from the rhythm. 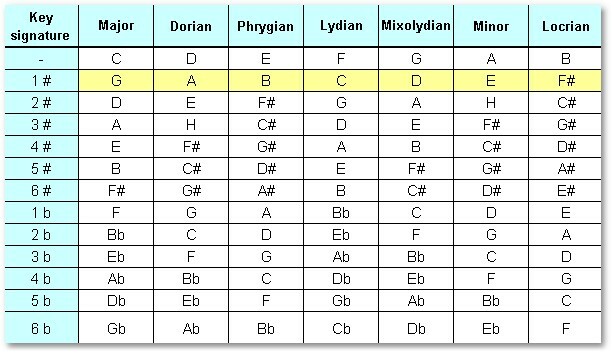 What is also apparent in the figure is that the chord system and even the melody can be derived from the scale system. 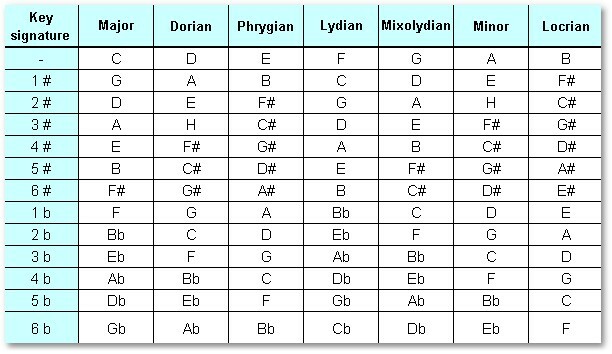 However, the scale system can never be derived from the chord system or the melody. Consequently, the scale system is what's taught first and foremost to students. 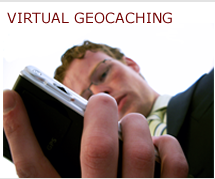 The OSIRE scale software can be a huge help with that. All in all, if you want to have a global insight of music, you will have to dig way deeper than just learning songs and melodies. 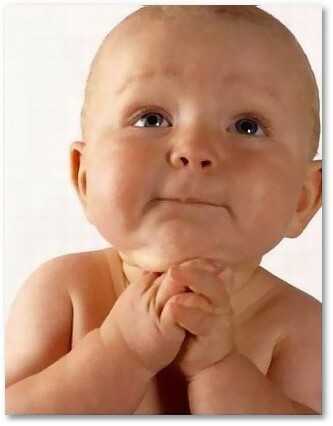 But thanks God, my methodology gives you exactly what is necessary to get that knowledge. The previous subsection proves that the sooner you learn the scale systems, the better. This subsection intends to demonstrate how the scales and melodies, the latter appearing to be scale patterns in Pénzes Methodology, are part of the songs and solo parts (with real life examples). The solo line, to which the music sheet comes down, can be played in many ways from a guitar point of view. What's important is that it remains transposable up the pitch. However, these are only for demonstrating the basic scale structures and not for matching the concerning solo line into one of them. You, provided that having the necessary knowledge over the scale systems, will find it very easy to put the solo line into these scales, whereas guitarists that only learn songs and melody lines may try to employ their superficial knowledge but will eventually fall short of the job. ...and for a B7 (B-D sharp-F sharp-A). Needless to say that what's been discussed so far is just scales and chords, no word said yet about scale patterns. So let's see: the general rhythm structure of the song is triplet. OSIRE demonstrates this with 000 digits. Two chords, however, represent another triple structure, which I call shifted triple 1, demonstrated with 001 digits, and 100 digits after the back turn. The latter is used in the second part of the song, in an ever-accelerating way. As a conclusion, the higher level of organized knowledge one has on the scale systems, the quicker and more confident these situations can be handled. The solo part can be smoothly played in two consecutive G harmonic minor scale degrees, which are the first (Minor) and the seventh (Locrian) degrees and have a trichord structure. Although this solo piece requires solid experience with guitar, Pénzes Methodology and OSIRE can considerably reduce the time and efforts necessary to learn it. The solo piece is further analyzed in Section dedicated to classical music. The tricky part of this solo piece is not the scale patterns but the rapid chord breakdowns, which is a technique pretty hard to master. Pénzes Methodology, with all that tremendous amount of scales, helps break down the difficulties. You can download the music sheet in Section dedicated to classical music. First of all, you have to be very well-prepared to play the semidemiquavers. The interpretation Zsuzsanna presents involves many dynamical trichord structures. In the middle of the solo piece (from the fifth bar in the music sheet) you can hear a distinct pattern that I would classify as a purely musical , i.e. non-mathematical scale pattern. 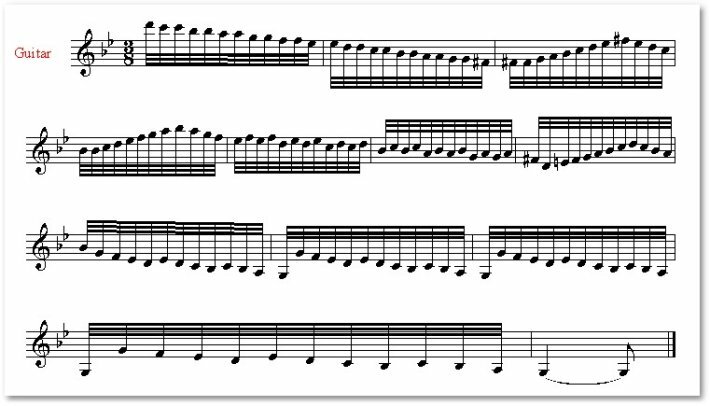 Right after that (from the tenth bar in the music sheet) comes a descending mathematical scale pattern, describable with 1012 digits (the inverse of 1210). The whole pattern repeats at the end of the solo piece. In between the two 1012 digit patterns there are some other patterns involving frequent string change. 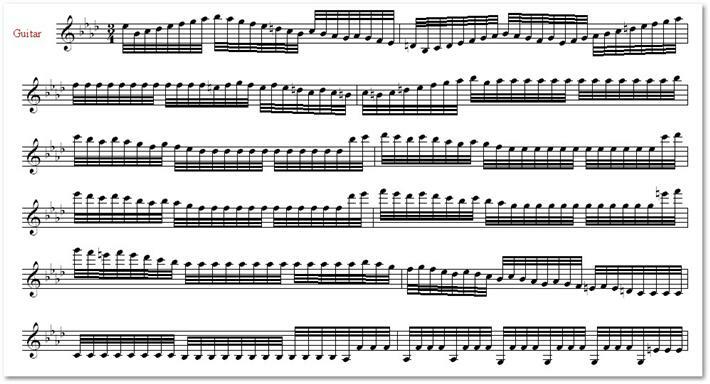 The rest of the melodies are either sequential scales or non-scale pattern melodies. 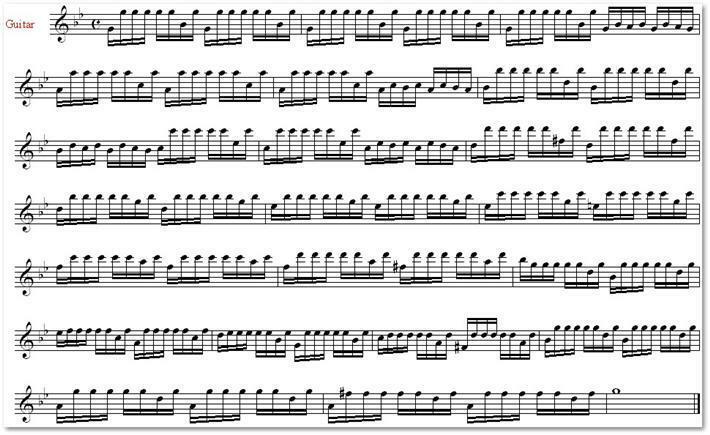 This little part of the whole piece of music is intended for piano (or organ), with the right hand playing the melody. Before publishing this section, I seriously considered if taking only this little part out of the whole music was the right thing to do. Then I reassured myself; this is the one solo part that's had the greatest immediate impression on all my students. Even if they are amazed of this solo part, yet usually they still can't feel D minor toccata and fugue to be a monumental masterpiece, as it is, because only having listened to the complete musical piece several times can you be aware of that fact. This one thing leaves us having to start with the little parts so that the whole will gradually get known. "If there are quotes from poems, there must be quotes from music, too." The solo piece I play has been transposed to an entire octave upper the pitch in the following music sheet, due to the nature of the tapping technique. This proves the fact that not only the notes of a certain scale can be used when composing a melody. Think outside the box; that's what quality music is known for. You can download this solo part in sections Tapping technique II. and Section dedicated to classical music. The melody changes a little in the second part of the main theme, but the one-string Phrygian scale structure will also help handle that. You can download this solo part in Section dedicated to classical music. The below video was intended for the Pénzes guitar contest and features some special video effects. 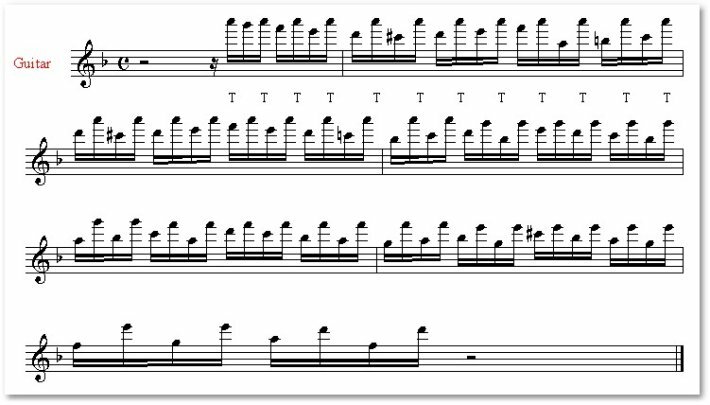 I would like to note that the above scale degrees are only my optimal way of playing this solo part; everyone can have the choice of their own to find their optimal way, which they eventually do. The only proof of someone's choice being really the optimal one is whether it can be played at a faster pace. Speed will always give you the answer. Peculiarly, there are no certain scale patterns in the song. However, there is a fast G major arpeggio in the middle part. On the other hand, the majority of the song is in A Mixolydian. It is indeed a very unique musical idea and an even better realization of it.